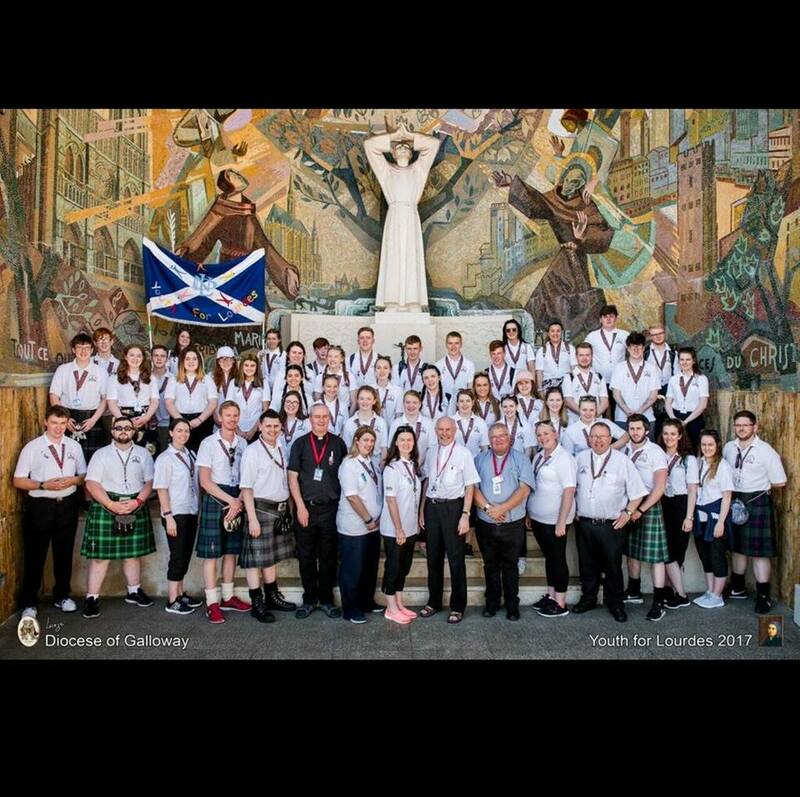 The official Youth for Lourdes photo for 2017. I first heard about Youth for Lourdes late 2016 when Fr Jim came to the school to talk about it. 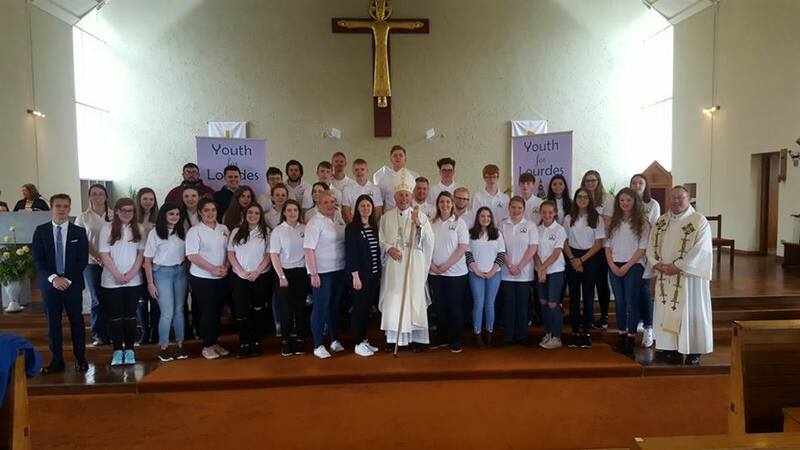 He told us that Youth for Lourdes was a Catholic organisation that sent youth (16 – 23) over to Lourdes to assist pilgrims and explore their faith every 2 years. It was a 10-day trip that would cost us £650. It sounds like a lot, I know. However, the money doesn’t come out of your own pocket. It comes from fundraising, whether that be a bake sale, sponsored walks or curry nights! It was hard work but we all managed it. Plus, if we ever had any problems with ideas, the team were always there to lend a helping hand. I went with the Galloway and Dumfries Diocese. I had agreed to go with a friend but honestly, I was still terrified. Around 50 youth went this year and I was worried that maybe we’d clash or just simply not get along. However, you aren’t really going with strangers. 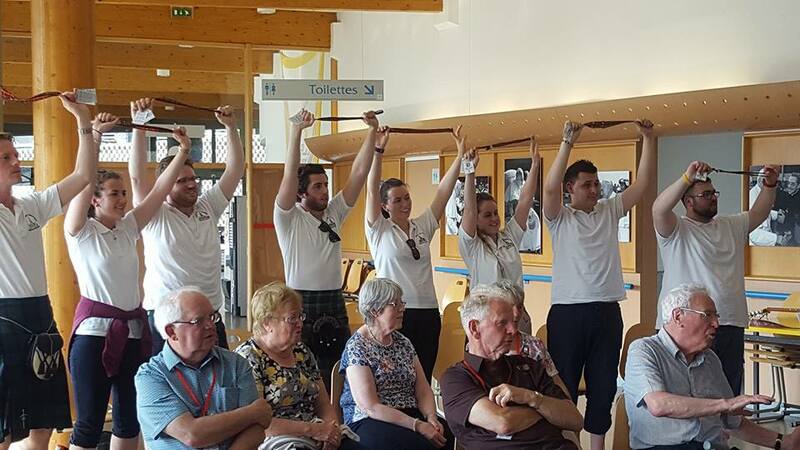 The amazing Youth for Lourdes team organise multiple meetings throughout the year before you depart on your journey. This gives you a chance to get to know one another, to check on how you are doing with your fundraising and to learn more about where you’re going and why. I loved these meetings because it helped me to feel more at ease about going away without my parents and I met so many amazing people. The meetings were always lively and fun as there were ALWAYS some little ice breakers. At first, they felt very abnormal and awkward but towards the end, you were just having such a good time that you forgot you were completely embarrassing yourself. Also, it helped that halfway through the 3-hour meetings, we got some snacks. However, way faster than I expected, we reached the last meeting and finally our trip was in our sights. Our blessing mass where we received our badges and uniform. Before I go on to talk about the journey to Lourdes, I believe that it’s essential to talk about why Lourdes is such a special place. On 11 February 1858, a young girl by the name of Bernadette Soubirous was with her sister and her friend looking for wood. When the other two girls went through the cold river, Bernadette decided against following because of her persistent asthma. She reportedly heard “a noise like a gust of wind” but “none of the trees were moving”. She looked up to see a young lady in a hollow of the rock (where there is now a statue) who looked at her and smiled. At this time the Grotto was dirty and damp, known as the “pigs’ shelter” because the pigs feeding in the area. This is where the Virgin Mary (Immaculate Conception) appeared to Bernadette. In total there were eighteen apparitions, spanning from February to July. You learn more about these at the meetings you attend for Youth for Lourdes. You also get the chance to take an assisted pilgrim and yourself through the Grotto. You must remove any hats and be quietly respectful. You get the chance to run your hand along the wall which is incredibly smooth after many people doing exactly this. I feel the Grotto looks especially beautiful at night as there are candles lit and a light shone onto the statue of the Immaculate Conception. 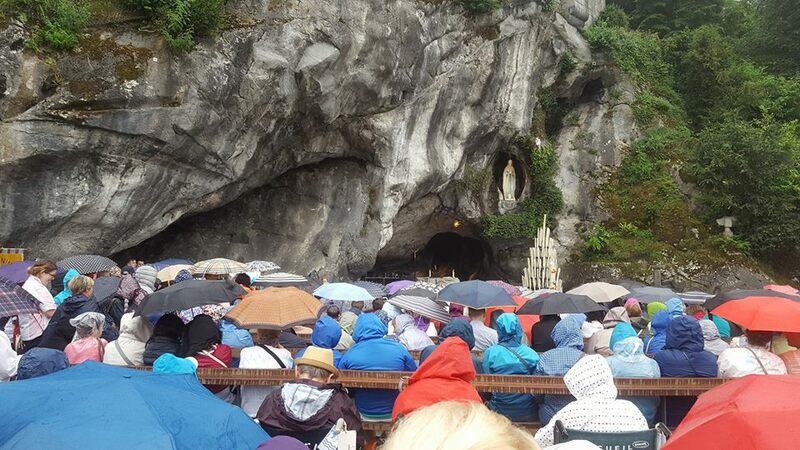 Our rainy mass at the Grotto. I feel I should also mention that Youth for Lourdes have a dress code. You can buy a polo shirt which comes with a Youth for Lourdes logo on it, or you can buy a hoodie (which is BRIGHT red) or a poncho sort of thing in case it rains. However, you get a free polo and are expected to wear a polo shirt whenever you are on duty. You can also bring plain white polo shirts, but I feel for picture day it looks better if you have a Youth for Lourdes polo shirt on. You also cannot wear jeans or leggings. It’s preferable that you wear dark trousers or a kilt if you so wish. Make sure that these trousers cover your knees because it’s frowned upon to have exposed knees in the domain. When they tell you it’s best to bring old trainers to wear on duty, listen! You will have an identity card and emergency numbers on a lanyard. You must always wear this on duty and when entering the domain. Personally, my favourite part of the uniform was the two badges we were given. They now have pride of place on my school blazer! Now, I won’t lie. The journey to Lourdes is exhausting and endless but also fun. I was the first pick up point, lucky me! I had to be at St Matthew’s Academy at 5:45 AM at the latest! I am not a morning person and never will be, so you can imagine how horrified I was when I found out the news. After a couple hours of sleep, I was off in my onesie, armed with a blanket, a backpack and a suitcase. The word “excited” doesn’t even begin to capture what I was feeling when I first saw the bus. After getting on the bus, we had a few other stops until we eventually wound up in Dumfries. The journey there overall took around 2 hours, and can I just say, everyone in Dumfries is so lucky that they didn’t have to make the journey up there. I am still insanely jealous of the fact that they didn’t have to wake up at an ungodly hour. However, when we got to Dumfries, we were greeted with rolls and bacon. I think it’s safe to say that that right there was probably my favourite part of the 36-hour long journey. After our breakfast, we took a group photo and then we were truly off. It was happening, there was no turning back now. Everyone bright eyed and bushytailed in Dumfries at 8am, ready to head off! After a long drive, we boarded the ferry to France. This gave us a chance to socialise a bit more and stretch our legs. Also, we got to freshen up which was very needed. After around an hour and a half, it was back to the bus. I wasn’t unhappy per se, I just really wanted to get to our hotel. I know I said that this bus journey was fun, and I am well aware how bad I am making it sound at this point. However, the bus gave us a chance to watch movies, mainly musicals which included a lot of singing along. It also provided us with even more time together. Now, you’d think we’d all be sick of each other at this point, but I think we may all have been a bit too fed up and tired to really experience that. It also helped that everyone there was entirely unique in their own way and, as a result, there was never a dull moment. The bus journey, for me, was full of short lived naps, crazy sing-a-longs and cherished memories. After a day and a half, we were in Lourdes. This was it. We were here. Now the adventure was truly beginning. Now, I won’t give you a play by play of our week there. I won’t lie, I can’t remember every single moment exactly. Instead, I’ll give you some of my highlights. Now, meeting the pilgrims was an experience of its own. I was nervous about what the assisted pilgrims would be like. However, I was pleasantly surprised when I discovered that everyone was lovely. I really shouldn’t have been surprised. Everyone else I had met had been lovely, why wouldn’t the people we were helping be? I had a somewhat regular pilgrim that I would assist. She was hard of hearing and could see very little and was also a complete sweetheart. Despite wheelchair training, I was horrific at steering at the beginning of the trip. This woman tended to laugh about it and jokingly complain about how much I would run up peoples’ heels. Luckily, I eventually got better at it and it was smooth sailing from then on. Anyways, the pilgrim I usually assisted had come with her friend. They had been friends since school and they had such an amazing friendship. They helped each other if they had any problems throughout the day, they bought candles for each other and were always asking for each other. Everyone’s experience with the assisted pilgrims is different, however, I believe they are always positive. I consider the assisted pilgrims my Lourdes family, as well as the group I went with and all the other volunteers. Our team leaders and some of the pilgrims at our goodbye party. I believe the Lourdes experience is a very religious one, but you do not have to be religious to attend. You will have to go to church at least once a day every day whilst, however, they just become second nature whilst there. I strongly advise that if you get the chance to go to Lourdes, whether it be with Youth for Lourdes or another organisation, then go. You won’t regret it. They warn you of the impossible-to-shake Lourdes Blues. You don’t think much of it at the time, however, in the last six months since returning, I have found myself missing Lourdes time and time again. Just writing this article makes me wish I was right back there in Lourdes! 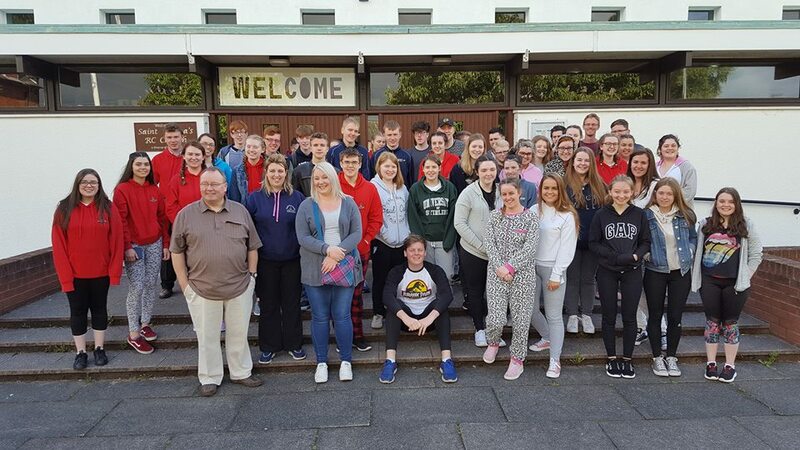 I have barely touched upon what happened at Lourdes so if you want to find out more, see more photos or get some information about the next pilgrimage, then head along to the Youth for Lourdes (Galloway) Facebook page. Whilst you do that, I’ll be counting down the days till the next pilgrimage. I can’t wait for the summer of 2019!